Apr.2008. 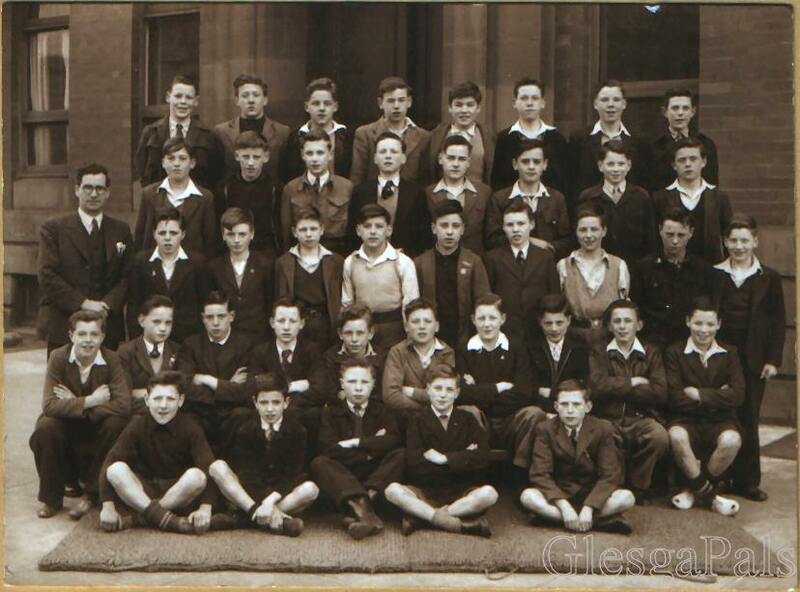 GlescaPal Janet Leggat (nee McGillan) Glasgow, sent in this old family school photo. 4th Row 1 Willie Quarrel ? Please contact the Webmaister if you can put a name to a face, or have a tale to tell. ".....my Dad's secondary school photo ....."
"I was at Riverside Senior Secondary school between 1946 to 1950 and appear in your 46/47 photo top row 6. I also know Jack Hamilton who appears in the same photo also top row number 7. Grateful if you could update your on-line photo on your web page. Angus"
Hi Webmaister, in the schools section there is a photograph of Riverside 1946. at the bottom there is a comment by Angus ( Gus ) Hunter. Gus was a close pal of mine at Riverside and into our teens after leaving. Is there any way you could supply me with his email address? It must be close to 50 years since I last had contact. Best wishes and thank you. Hi Webmaiter, thank you for your effort to get me Gus Hunter's address. So far I've not had a reply. On the subject of that Riverside photo, I'd like tell you that the teacher shown is not Eddy Palmer. Wee Eddy was a math teacher and was almost bald. The teacher shown is Mr. Jenkins. In the top row # 5 is Willie Miller ( Millar ). In front of Willie, # 5 in the 4th row is Alistair Gilmour. I'm sure Gus has made a wee mistake in his dates. I can't remember when he started at Rivvy, but he was not there in 1950, we were in the same class and he left before me. I went to Rivvy in Jan.1946 and left in the summer of 1950. At that time there was only one class consisting of 5 girls and 3 boys. Apart from myself, the other 2 boys were the aforementioned Willie Miller from Nuneaton St. and Ian Currie from Fraser St. In later years I worked with John McGillan, he was Rangers mad and played in the Hugh McGill Memorial FB. Dec 2009, extract from email, Tommy Thomson, Zimbabwe. I'm a 75 year old Glesca lad who, at the end of 1958, accepted a two years' employment contract in what was then Rhodesia and is now Zimbabwe. I enjoyed the perfect weather and lifestyle so much I've been here ever since. Riverside school class of 1946. I remember many of the faces but not names. However, one I do know is Gus Hunter. The houses we were both raised in, were at either end of Glenisla Street. Gus and I played fitba for the school and we both were selected to go to the Lesser Hampden trials for the Glasgow Schoolboys select. Gus was selected. I'd really like to know Gus' e-mail so that I can reconnect with him. I was surprised and delighted to see the photograph of my class at Riverside Senior Secondary School 1946. I am standing in the third row, extreme right. (3rd row 10). I recognize many of the faces but can't remember names. After all, it was 66 years ago. I wish I had made a list of all the lads in the photo on my own copy which I still have, but then you don't think of those things at 12 years old. I have never seen any of them since I left school in 1950. Would love to hear from anyone who remembers me. Fred (Freddie) McKenna. PS In row number 4 (second top) I THINK that number 1 is Willie Quarrel and number 2 MAY BE Robert Ferguson. It would be good to get together with some of my old classmates to see if we could revive our memories and identify some of the other pupils. I reckon you are doing a great job on this site and hope you keep it up. ....GlescaPals is still flourishing, I know it is, I keep visiting the website! I would like to add a couple of items, the first is an old photo of the Hugh Magill Flute Band........ Re-the Riverside school photo 1946 I can add some names: Top row 8, George McIntosh. 3rd row 5, George Stevenson. 3rd row 8, Alex Barbour (me). I hope this helps to name the class. Dec. 2012, email, Peter Don, England. .... Re.rivvy photo 1946 attended rRivvy 1945/48. Recognise Gus Hunter and Jack Hamilton. Teammates in School football team. Also, top row, number 4 Jimmy Morrison who sadly died Age 16/17. Played same team as Jimmy,nice lad, great keeper. Great Website please keep updated. Aug. 2016, email, Benny Thomson, age 82, Huntington Beach, California, USA. I went to the school the same time, I was in a mixed class both sexes it was supposed to be an academic class. Was good friends with James Morrison and Robert Ferguson, I knew Junior McGillan real well as I ran about Baltic St. all during the war as my relatives lived there (Miles and McNeil). Chas Stirling lived real close to me I lived on Springfield Rd. right facing Riverside. Sorry about rambling on Benny Thomson!